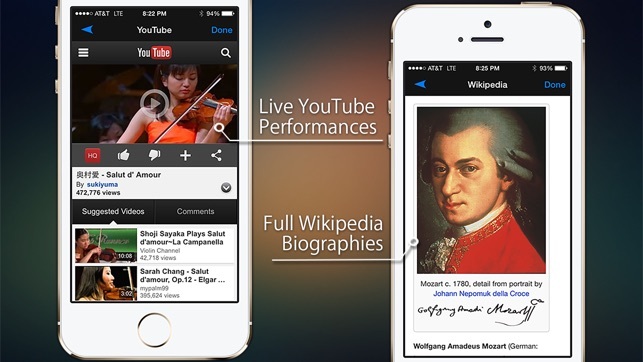 Ranked #1 Classical Music App Worldwide! Optimized for the latest iOS and iPhone / iPad! "... Exquisite App! Once again, awesomely beautiful selection!" "... the app got me what I've tried for YEARS! ... to find all those pieces that sound familiar but don't know what they are and how to find!" 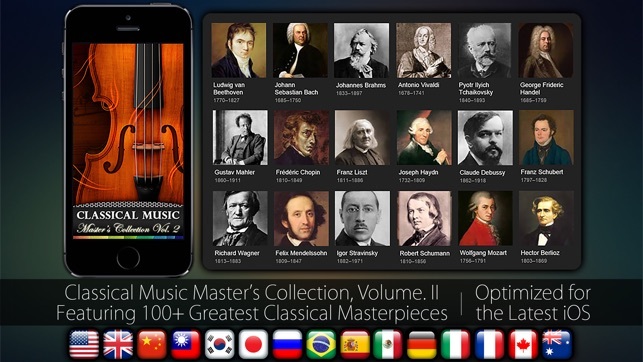 "Classical Music: Master's Collection, Vol. II" presents 110 Completely New & Different Masterpieces and you will love the melody of these imaginative, energetic, and romantic masterpieces. We know its hard to choose among tens of thousands of classical music pieces, so we hope you enjoy only the BEST that's proven timeless, soul enlightening, and thought provoking with this selections. All pieces are professionally handpicked by music experts and performed by famous orchestras around the world! 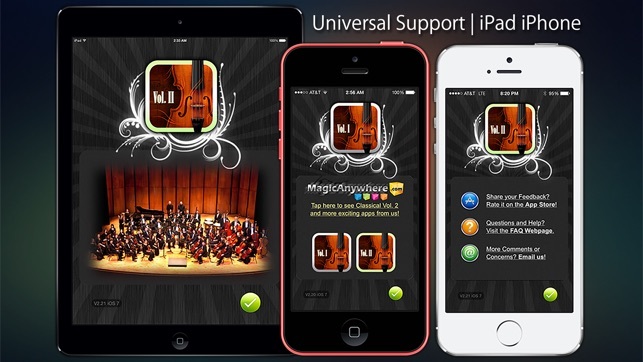 IMPORTANT: The app starts out as a free version where you enjoy limited audio tracks. 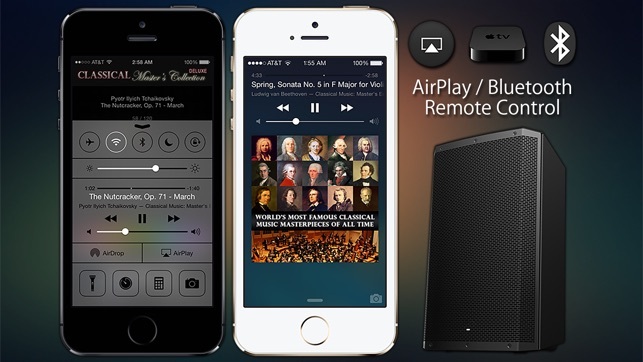 A Deluxe Upgrade will enable music playback in full length for an uninterrupted listening experience. 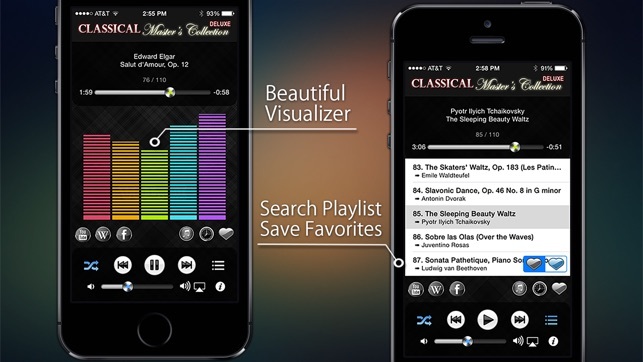 Listeners less familiar with Classical Music can discover interesting masterpieces for free. - iOS 11 Fixes and Improvements. - Better Favorite Song Management. Love the wide variety of music, especially all my Debussy favorites! I have not had any problems with it charging me more than the one time or converting back to the free ap. I have classical volume 1 and 2 and wish they would come out with a third! 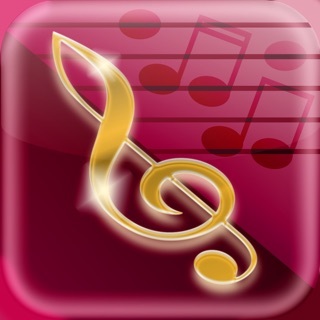 Have loved both musical apps since the iPad first generation was released!!! Many thanks for updating to iOS 11 so my family and i can continue enjoying the love of classical! !